Whenever a new marketing channel opens up, there are always a few companies that lead the way by testing it out first. Mobile advertising is one of those emerging channels. With consumers spending more and more time on mobile, and click-through rates being up to 12x higher on Facebook mobile ads than on desktop, businesses are starting to put a greater percentage of their budget towards mobile advertising. In this post, we’ll highlight a few case studies of companies that have done mobile advertising well. Potbelly is a “happening sandwich shop” chain that has locations all across the United States. They used mobile advertising to promote a new sandwich that they introduced in their restaurants. Because Potbelly operates from physical locations, they had to make sure they targeted only the customers that lived within a certain radius from one of their restaurants. Potbelly turned to Placecast to design and deploy their mobile ads. According to the case study, Placecast set up a five-mile “geofence” around certain Potbelly restaurant locations in Illinois, Texas, Washington DC, Virginia, Maryland, and Indiana. Geofences use GPS technology to set virtual boundaries around specific addresses. These are particularly helpful if you run a local business with one or more physical locations — this way, you can make sure that your ad dollars are being put to good use because you’ll only reach people who are in close proximity to your physical location. 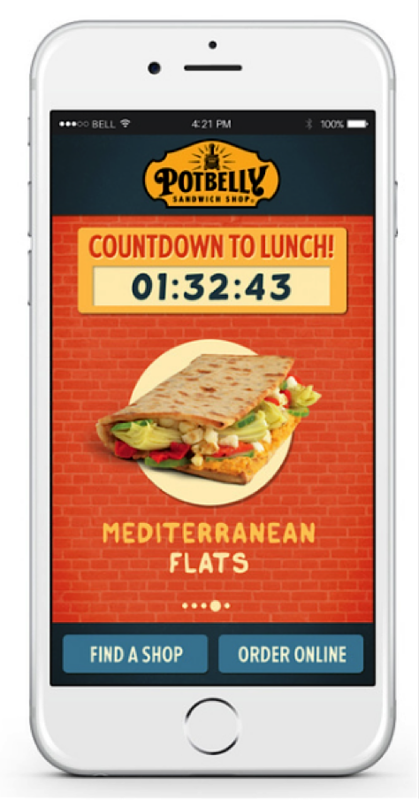 Potbelly deployed in-app mobile banner ads to promote their new sandwich called “Flats” and the campaign generated over 1% click-through rates. 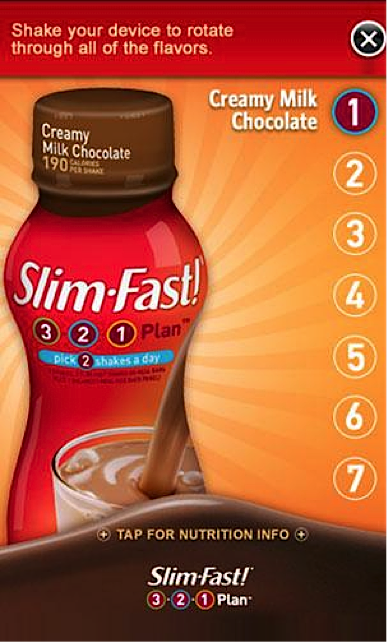 SlimFast produces bottled meal replacement drinks and snacks to help people lose weight. To increase their brand awareness, they launched an innovative mobile ad campaign that centered around gamified advertisements. Gamified ads are advertisements that people can interact with as though they were playing a game. For example, if you’re advertising a new app that you produced, you could run gamified ads so that users can interact with, or “play,” your app as they would if they had downloaded it. SlimFast made good use of this info. To build more brand awareness around SlimFast’s seven new flavors, they turned to InMobi to create an interactive mobile ad experience similar to what customers would feel when drinking a bottle of SlimFast. The ad showed each of the new seven flavors and asked users to shake their phone (like they would shake a bottle before opening it) to rotate through each of the flavors. 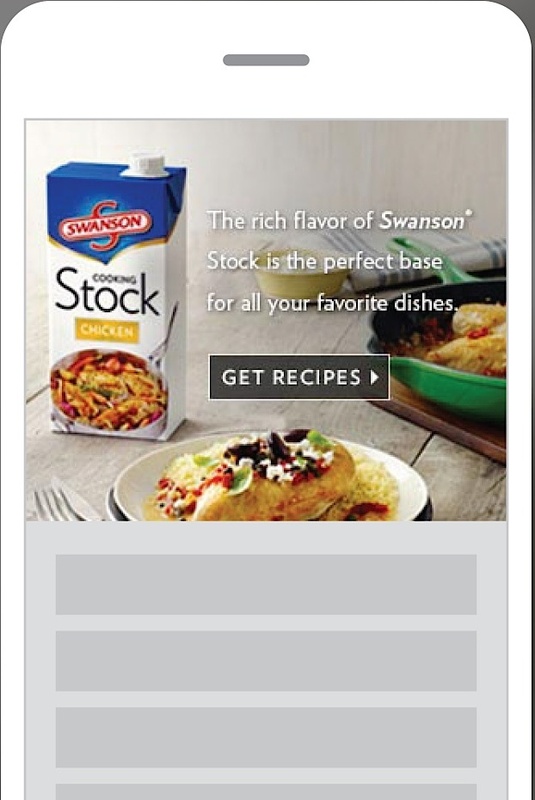 Once each flavor is displayed, users have the option to see nutrition information or click through to SlimFast’s site. Users interacted with three pages, on average, and the ad had engagement rates that were double industry standards. 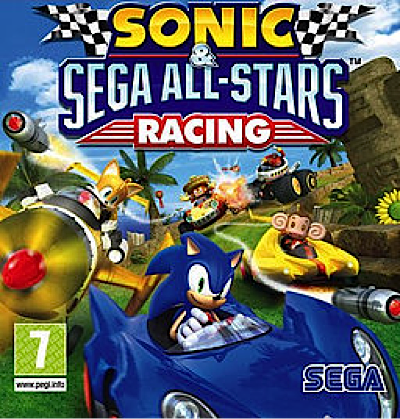 Sega is a game development company that has produced widely popular games like Sonic the Hedgehog. They partnered with InMobi to help promote a gaming app called Sega All-Stars Racing to get higher rankings on the app store, and targeted gamers aged 14 – 34. According to the case study, Sega released a new game on iOS to commemorate the 20th anniversary of Sonic the Hedgehog and to promote the app, they ran display banner ads across iOS devices. Once users clicked on the banner ad, they were taken to a dynamic landing page where they could watch the game trailer and install the app. If your goal is to increase conversions or get users to take some type of action, video can be a great way to do this. 90% of people say that product videos are helpful in the purchasing process, and one in three consumers watch videos on their mobile devices. Because video is quick, easily digestible content, it can be incorporated into mobile ads to increase your conversions. Lancôme is a cosmetics company that produces skin care products and perfumes. When they launched their new Advanced Genifique product, they wanted to run mobile ads to increase their brand awareness. They targeted women, who of course make up the vast majority of their customer demographic. 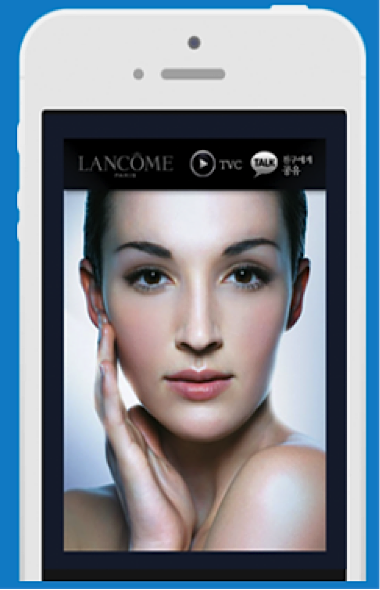 Lancôme wanted to engage users across multiple touch points in order to cement the message of their product and brand in the minds of users. They launched a mobile ad campaign that included running banner ads across a variety of apps that had women as their target users. Once users clicked on the banner ad, they would be directed to an interactive, animated video that showed them what the product was about. According to the case study, the biggest factors that determined the success of this ad campaign were the app categories that ran their ads, the time slots in which the ads were displayed, and the type of mobile devices they ran the ads on. NOVA is a large 2-year college in Springfield, Virginia. This community college wanted to drive more brand awareness to their school leading up to the start of a new academic year. 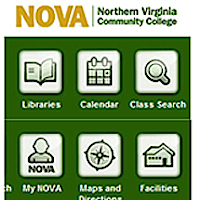 To do this, they ran clickable banner ads that led users to NOVA’s mobile website when tapped. Because they’re based in Virginia, it was important to use geofencing to target only users living in specific locations: Arlington, Fairfax, Loudoun, and Prince William. NOVA wanted to reach college-aged individuals between 17 and 25, so they ran these ads on sites and apps with a similar demographic. The ads were also displayed based on the interests of the end user’s mobile activity. According to the case study, they received more than 20,000 clicks over a two-month period on their banner ad. Emirates is an international airline based in Dubai, United Arab Emirates. To meet increased demand from travelers, Emirates added more daily flights from New York City to Dubai. Before launching these new flights, they needed to build brand awareness toward this new initiative and show passengers why they should choose to fly Emirates. They decided to launch a mobile advertising campaign to reach travelers while they were on the go. Because they were trying to promote flights specifically from NYC to Dubai, they needed to make sure that they were targeting travelers around the New York City area. For this reason, they directed their ads to travelers flying through JFK Airport, LaGuardia Airport, and Newark. This way, Emirates was able to reach affluent travelers on their mobile devices, since they’d likely be connected to Airport WiFi. Emirates showcased their luxurious amenities using full-screen interstitials (usually displayed during points of transition in a mobile app) and video ads. For example, if you run an interstitial ad in a mobile game, it might be displayed once the user completes a particular level. On the interstitial ad, users typically have the option to click through to the advertiser’s website, watch a video, or click the “X” and go back to what they were doing. 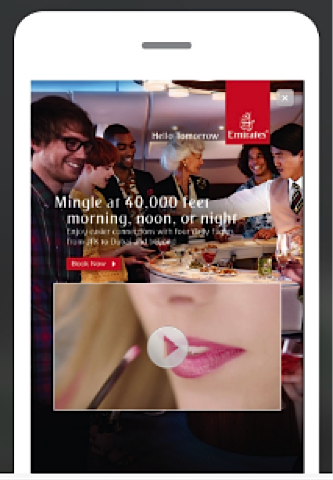 Emirates included a video in their interstitial ad to highlight the benefits of their airline. According to the case study, Emirates got over 5,000 clicks to their website, and over 170,000 completed views on their video. Campbell’s is famous for their canned soup, but they also have a brand called Swanson under which they produce broths and other cooking ingredients. They wanted to increase their in-store sales of their broth around the holiday season, and the narrative around their advertisements was to encourage foodies across the country to be more creative when cooking their holiday dinners. Because Campbell’s specifically wanted to boost in-store sales, they had to include geographic targeting in addition to demographic targeting when running their ads. They also used Millennial Media’s Product Purchase Rate measurement solution, which helped them track the ROI of their mobile ad spend and its effect on in-store sales. According to the case study, Campbell’s in-store sales increased by over 7% as a result of the campaign with a 4x return on investment. 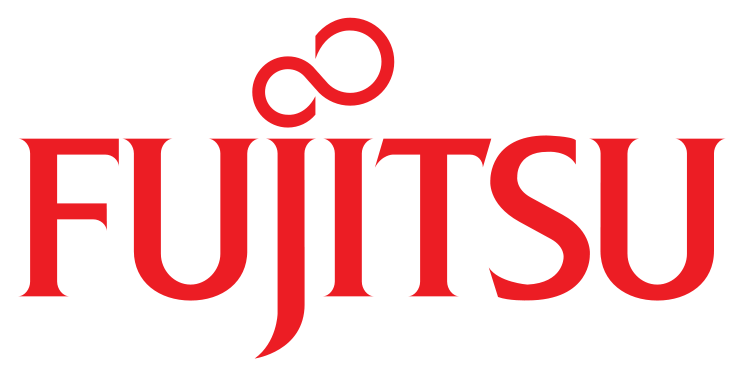 They also exceeded Nielsen Catalina’s benchmarks for food products by 43%. True Blood is a fantasy/horror TV show that runs on HBO. To promote the third season of their show, HBO ran an interactive mobile ad campaign. When users tapped the screen on their phones, they would see a bloody fingerprint appear and with each new tap, they would see a new bloody fingerprint. Eventually, after enough taps, users would see blood dripping from the top of their screen down to the bottom. When the blood reached the bottom of the screen, there would be an interstitial advertisement from True Blood along with a trailer. 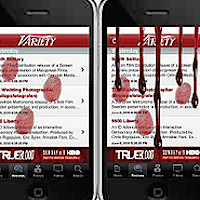 The targeting for this ad campaign was aimed at movie lovers, so True Blood ran these ads on apps like Flixter or Variety, where cinematic fans would go to read reviews. The ad also ran on other movie-related sites. It’s well known that interactive mobile ads perform better than static ones because they’re more entertaining and create better ad experiences for the viewer. According to 60 Second Marketer, this helped increase their viewership by 38%, or 5.1 million people. Virgin Media provides cable, TV, and phone products to consumers in the United Kingdom. They wanted to raise awareness for their new soccer TV packages. 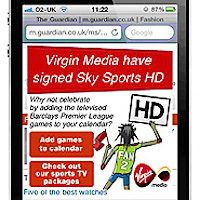 To do this, Virgin Media ran simple banner ads across a variety of media sites with UK audience members, such as the Guardian. When users clicked on the banner ad, they were presented with a full-screen advertisement that prompted them to click through to Virgin Media’s website to find out more about the TV packages. In addition to this, users also had the option to automatically sync all the dates of televised soccer games directly to their iPhone calendar. This way, they would get notified directly on their phones whenever a new game was about to air, and would remember the fact that Virgin Media offered TV packages to watch it. Virgin Media also added over 100,000 premium subscribers, with over 52,000 customer who subscribed to the sports package since the launch of the campaign. Crocs, a company that produces footwear, ran a mobile advertising campaign to drive more in-store sales for their shoes. 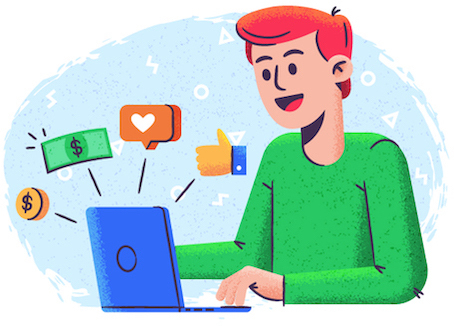 Many companies use banner ads or other mobile advertising tactics to drive brand awareness, but it’s also possible to use similar strategies to generate more direct sales. 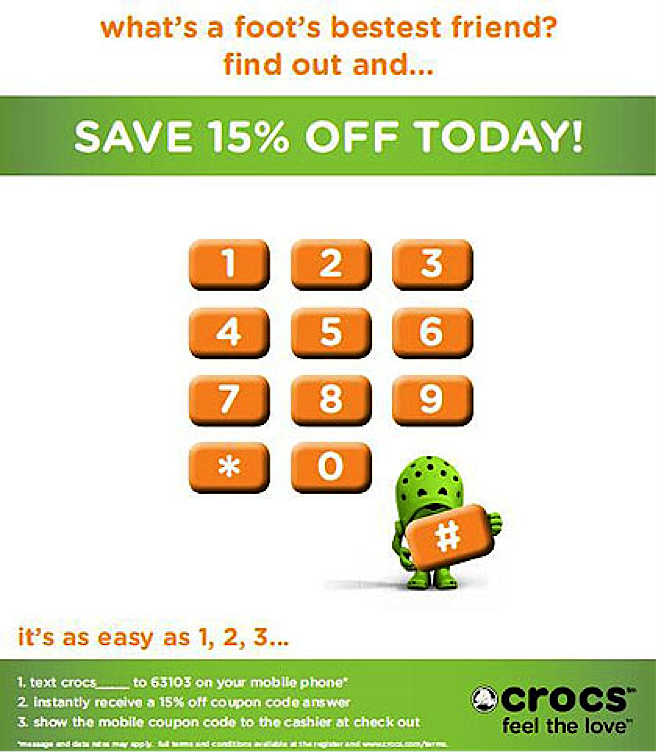 To increase the number of in-store sales, Crocs ran ads that prompted users to text a number to receive a discount code. The goal behind this was not just to increase sales, but also to create a better in-store experience for customers. For this reason, Crocs displayed these ads across 185 retail locations nationwide. They even trained store associates to support the program and speak with customers about the mobile coupons. According to the case study, Crocs received over 94,000 requests for coupons in the first month of the campaign. Because users didn’t have to print anything or carry any additional material with them to take advantage of the discount, they were more incentivized to use it. Crocs continued to leverage mobile marketing after the campaign by sending targeted messages to consumers about their previous shopping experience, purchase history, and more. 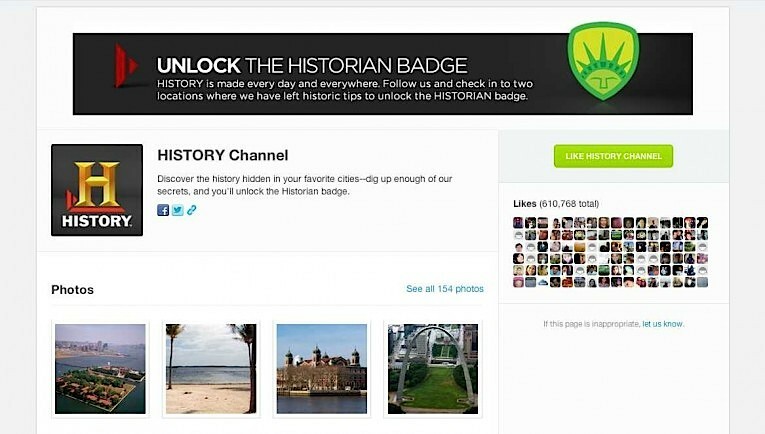 History Channel, a basic cable and satellite TV channel, leveraged Foursquare to connect with potential new viewers. On the Foursquare platform (which gets 2,000 check-ins per minute), users can check in to a variety of locations all over the country. In this campaign, when users checked into specific locations, the History Channel sent tips to them with historical facts about that location. For example, according to the case study, users might get a “tip” that they’re near the location where the world’s first elevator was sold when they check into a place near Skylight Studios in New York City. This way, they were able to connect and build brand awareness with history enthusiasts who may not have already been watching the History Channel. Even though it seems like mobile phones have been around forever, mobile marketing is still relatively new. Consumers are spending more and more time on their devices, and businesses are slowly warming up to the idea of putting more of their marketing budget into mobile. The brands who are doing this are seeing massive ROI. In fact, from 2009 to 2015, mobile advertising revenue increased by 66% — over 10x more than desktop ads! As with any new marketing channel, the biggest benefits always go to the ones who get in on it early. Which case study did you find most compelling? Let us know in the comments!